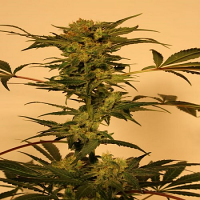 American Pie Feminized from Pyramid Seeds is a blend of Power Plant and White Widow which create this new variety and with a parenthood like that American Pie can not disappoint you especially when it comes to yields and the potency of the end product. 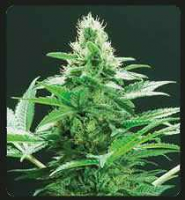 American Pie from Pyramid Seeds is a wonderful South African strain who require easy care and has a good reaction in every growing system. American Pie Feminized by Pyramid Seeds is 60% Sativa and 40% Indica hybrid and it is suited for indoor and outdoor cultivation responding exceptionally well to LST, making the perfect candidate for the SOG and ScrOG method. The ease of growth makes American Pie Feminized by Pyramid Seeds a great choice for beginners and rewards the grower with large, compact and extremely resinous flower clusters. In an indoor setup the plants will reach full maturity after 65-75 days of flowering with an average harvest bringing about 550g/m² to the scale. Outdoors the time for harvesting has come in the middle of October. With a THC level of 20% and only 0.6% CBD you can expect an intense cerebral high.